BERLIN (Reuters) - The German government is debating whether to follow the United States and allies like Australia in restricting China's Huawei Technologies from accessing its next-generation mobile networks on national-security grounds. 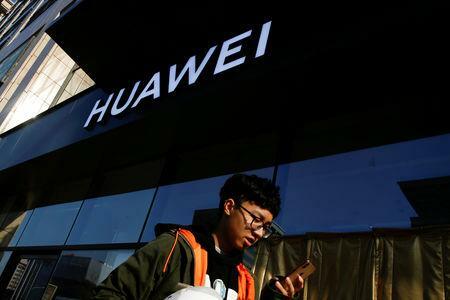 Some Western countries have barred Huawei from their markets after U.S. officials briefed allies that Huawei is at the beck and call of the Chinese state, warning that its network equipment may contain "back doors" that could open them up to cyber espionage. Huawei says such concerns are unfounded. "The process of reaching a common view on concrete steps has not been completed," said the Interior Ministry's response, which was seen by Reuters. Germany's Deutsche Telekom announced in December that it would review its vendor strategy and France's Orange said it would not hire the Chinese firm to build its next-generation network in France. The deliberations in Berlin mark a shift from the German government's position in October, when it told lawmakers it saw no legal basis to exclude any vendors from an upcoming 5G auction following warnings from Washington. In a statement, Huawei welcomed Berlin's push to verify and standardise technology solutions which it has supported by opening an information lab in Bonn to help regulators scrutinise its gear. "We are very optimistic that we can completely fulfil all security requirements for 5G networks," Huawei said. "We see no rational grounds to exclude Huawei from the construction of 5G networks in any country around the world."